Fresh startâ€¦ TTFA bow to schoolboys. Lasana Liburd continues his 11-part World Cup series with a look at the 1970 campaign and the emergence of talents like Leroy De Leon, Everald Cummings and Warren Archibald. The Trinidad and Tobago football team returned from Suriname on March 15, 1965 with red faces as the 1966 World Cup campaign ended with an embarrassing 6-1 defeat to its Dutch mainland rivals. There was no shame in losing to a talented Surinamese outfit but the margin of defeat left a bad aftertaste, particularly because Trinidad and Tobago kicked off its campaign with a 4-1 win over the same opponent at the Queenâ€™s Park Oval on February 7, 1965. Team captain Sedley Joseph and his troops, which included talented goalkeeper Lincoln â€œTigerâ€� Phillip and skillful attackers like Andy Aleong, Alvin Corneal and Gerry Brown, were humbled but felt certain they would build on the experience. It was not to be, though. The national outfit, in those days, was chosen by a panel of administrators rather than the team coach and the selectors always seemed anxious for a revamp. Within months, Joseph had a precocious new teammate who would become one of local footballâ€™s all time greats. Everald â€œGallyâ€� Cummings was still 16 when he won his first cap in a 4-0 defeat away to Jamaica on August 5, 1965. A Tranquility Government student, Cummings went on to serve his country with distinction for over three decades and remains a household name. Forty-one years ago, Cummingsâ€™ selection signalled a bright future. Short and athletic, the Paragon Sports Club playmaker had a powerful shot and vision and was always willing to try a trick. But, arguably, even better was to come as the country became seduced by a talented crop of schoolboys. 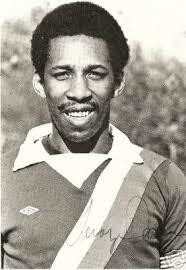 Today, Cummings remains the only footballer to be named Trinidad and Tobago Sportsman of the Year while his accomplishments as player and coach are unrivalled. Yet, the player who many grey beards rate as the most gifted product of this tiny twin-island republic was still largely unknown north of San Fernando at the time. His name is Leroy De Leon. De Leon was born and grew up in Point Fortin. His father, Sistel De Leon, never played sport and young De Leonâ€™s slight build and left knee that curved inwards did not seem to indicate a star athlete. But more overwhelming than De Leonâ€™s shortage of sporting genes and physique was his uncanny knack for tricking opponents and his grasp of the cerebral aspects of the game. The Trinidad and Tobago Cricket Board of Control was first to spot his potential and football nearly lost a gem when De Leone scored an unbeaten half century as a 13-year-old in Barbados. It was his maiden tour as a national player for any sport. St Benedictâ€™s schoolmaster Dom Basil Matthews heard of De Leonâ€™s ability with a football and recruited the diminutive midfielder to his all conquering schoolboy team that included Warren Archibald and Wilfred â€œBound to Scoreâ€� Cave. But word of his prowess had not yet reached Port of Spain when De Leon visited the Queenâ€™s Park Oval in 1965 to play in the North/South Classic as a 17-year-old. North Zone player Raffie Knowles sized up his opponents on the day and loudly dismissed them as â€œa bunch of kidsâ€�. De Leon seethed but the scoreline vindicated Knowles at the interval as North led 2-0. But the final straw came as the teams returned to the field after the half-time break and a spectator inadvertently heaped one indignity too much on the proud De Leon. The rest of the fixture was a blur of step overs, dinked passes and goals. At the final whistle, South were 5-2 victors and the local FA had unearthed a new star. Months later, De Leon proved it was no fluke when he again bedazzled the powerful North outfit with a superb individual performance in south Trinidad. Selectors were confounded to see the teenager strike terror into the national skipper and respected centre-half, Joseph. At one stage in the match, De Leon took possession and made a beeline to Joseph who backpedaled furiously from the centre circle. â€œJoseph was shouting to his teammates â€˜tackle him, tackle himâ€™,â€� claimed one observer, â€œand De Leon just kept pushing the ball straight at him. He crossed over the ball one way and then the next and Joseph just fell right on his backside. St Benedictâ€™s was found to have used over-aged players in the schoolsâ€™ competition and Matthews was forced to return trophies in 1966. But De Leon, Cave, Archibald and Jan Steadman were already senior players. The quartet, as well as Cummings, was signed by North American Professional Soccer League clubs in 1967. Even in the absence of such talents, Trinidad and Tobago celebrated its first major medal at the 1967 Pan American Games in Winnipeg, Canada. The Pan Am Games was strictly an amateur tournament and few teams were at full strength but T&T fans were still greatly encouraged by famous wins over Argentina (1-0) and Colombia (5-2) and a 1-1 draw with eventual winners, Mexico. Trinidad and Tobago ended the competition with a bronze medal after losing 3-1 to the unfancied Bermuda in the semi-final but there was still plenty enthusiasm for an improved showing at the 1970 World Cup qualifying campaign. Eager young faces were everywhere as the TTFA performed a remarkable clear out of the countryâ€™s senior players. Only Tyrone de la Bastide, a central defender, remained from the starting team of 1966 while goalkeeper Jean Mouttet was understudy to Phillips, four years earlier. De la Bastide was partnered in central defence by Selwyn Murren while Lawrence Rondon and Arnim David began the campaign at full backâ€”Steadman eventually replaced David. Rawle Aimey did the dirty work in midfield alongside the graceful De Leon while Cummings and Archibald played supporting role to strikers Ulric â€œBuggyâ€� Haynes and Cave. The odds were against the boys in â€œred, white and blackâ€� strip from even before a ball was kicked, though. Trinidad and Tobago was scheduled to play two-legged fixtures against Guatemala and Haiti to progress to the final qualifying round. But the players soon discovered that they would play all their games on foreign soil. TTFA president Eric James had forfeited his associationâ€™s right to compete at home and whispers in the dressing room suggested that the national outfit was sold out. â€œWe could have played at least one game in Trinidad for we home crowd to get to see we self and get we home support,â€� lamented one player. Home felt a galaxy away after the opening World Cup qualifying fixture away to Guatemala on November 17, 1968. Guatemala trounced T&T 4-0 and the margin of victory did not flatter the hosts. Trinidad and Tobago was led, at the time, by English coach Michael Laing and Cummings was among a group of dissidents who felt that Laingâ€™s insistence on direct play did not suit the teamâ€™s style and conceded possession too easily to the Central Americans who made better use of the ball. The second tie was held at the same Mateo Flores Stadium, three days later, and Laing sacrificed Cave for an additional midfield workhorse in the form of Kenneth Butcher. The visitors managed a goalless draw but the horse had already bolted. Cave returned for the first leg away to Haiti on November 23 in place of Aimey as Butcher kept his place but an emphatic 4-0 loss ended all hope of progression. Despite the poor results, Trinidad and Tobagoâ€™s reputation for producing good individual talent was blossoming. Considering the fact that T&T conceded eight goals and scored none in its opening three outings, it was a testimony to De Leonâ€™s outrageous skills that he received the MVP accolade for his performances in the group stage. A silky bag of tricks, De Leon was unstoppable in possession and had the confidence to match his ability. â€œMy main strength was my tricksâ€¦ but I could analyze a game and my opponents. What position was a defender standing in? How can I take advantage of him? Trinidad and Tobago got some consolation in its final fixture with a 4-2 triumph over Haiti in Port-au-Prince. Archibald, a graceful, athletic left sided attacker, scored three times with Cummings bagging the other item. Haiti did not roll over and there was a fierce exchange of tackles in the closing minutes as the French-islanders took exception to Trinidad and Tobagoâ€™s dribblers. â€œI remember the ball was out of play and I was going for water,â€� Cummings recalled, â€œand a Haitian player just kicked me. Keith Renaud saw what happened and ran on the field and cuffed the guy in his face and got a red card. Another unsuccessful campaign ground to an end but Trinidad and Tobago fans were convinced that their national team was better than the records suggested. De Leon and Cummings were both just 20-years-old while Archibald, Cave and Steadman were not much older. If only they could keep these talented youngsters together, surely things would be better at the 1974 trials. Goals: Warren Archibald (3), Everald Cummings. Trinidad and Tobago used a similar 4-2-4 line-up as its 1966 campaign although only Tyrone de la Bastide kept his place. Jean Mouttet started in goal while (from right to left) Lawrence Rondon, de la Bastide, Selwyn Murren and Arnim David started in front of him for the opening qualifier. Rawle Aimey and Leroy De Leon patrolled the midfield area with Everald â€œGallyâ€� Cummings on Warren Archibald on the right and left flanks respectively. Ulric â€œBuggyâ€� Haynes and Wilfred â€œBound to Scoreâ€� Cave started upfront at centre forward. Warren Archibaldâ€™s treble in T&Tâ€™s final outing was the countryâ€™s best individual scoring performance in a World Cup qualifier. Mouttetâ€™s shut-out against Guatemala was also the first clean sheet by a local goalkeeper at this level. At 20, Cummings was also T&Tâ€™s youngest scorer in World Cup competition at the time. Re: Fresh startâ€¦ TTFA bow to schoolboys. Good work Lasana, real stuff here our youths could learn from. That was a good read. Lasana realy know he stuff ah wonder if he have any of them games on tape. Cummings is the only Footballer to win Sportsman of the year Award? Latas and Yorke never did it? I'm pretty sure we lost to Canada in the semis of the Panam Games not Bermuda. But maybe I getting old, and Lasana acutally did some research b4 he write the article. Lasana nice read Breds,this brings back a lot of good memories,i want all to know this is the foundation we still standing on. If we look at the history of T&T Football you will agree that our Secondary Schools have always played a major role in our Football even to this day,having said that my recommendation would be for the Government/TTFF should have qualified Coaches assigned to schools and have Football on the schools curriculum. The only other footballer who won the Sportsman of the Year award was Carlton Franco in 1960. Yes, T&T lost to Bermuda in de semi-final, but dey beat Canada 4-1 to win de bronze medal. We are putting the cart before the horse in our priorities. We have to put the emphasis on investing in our youths in their early teens by hiring qualified coaches in the SSFL. If we allocated a fraction of the National Team funds to provide better SSFL coaching, we would see the SSFL product improve. Gally is the only footballer to win WITCO sportman of the year. I think Carlton Franco won it in 1960. But the sportsman/sportswoman of the year was not as official until WITCO sponsor the award and have the presentation on TV. I thought that Dwight could have won the year Man U won the treble. BUT TTFF did not nominate him. The freeing was that he did not play his football in TT that year. You ever believe that??? Cricketers, track athletes, cycling and swimming have dominated the award. Team sports don't have a chance. So basically football in T&T has not improved.